Play alongside 3 million Heirs! An animated RPG world in the palm of your hand And thus began the 7th World... Diche, the Goddess of Life, summoned all of her waning power and once again gave shape to the Guardians and the Heir of the Covenant. "My children, I entrust this world to you." ● Over 1,000 Stories An epic for the modern age. We invite you into the 7th World. 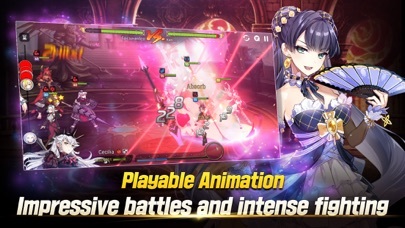 ● Fully Playable 2D Animation Dazzling skill animations in battle! Cutscene-quality 2D animated graphics! 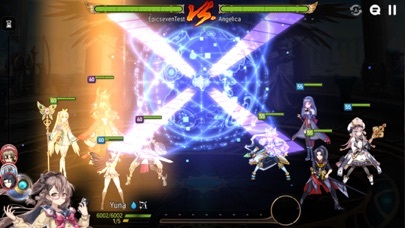 ● Strategy Shaped by Story Dual Attack system affected by relationships between characters. 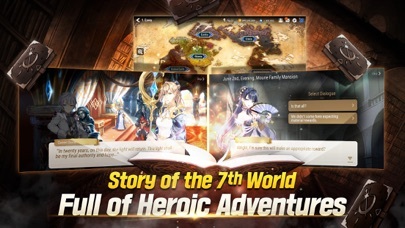 Immerse yourself in all the stories and perfect your own strategy! 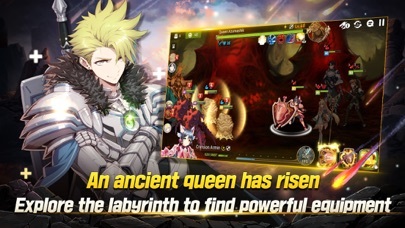 ● Raid Labyrinth In the depths of the Labyrinth, an ancient queen awakens from her slumber. Embark on a monster hunt with incredible rewards. ● PvP Arena Who will achieve fame and victory in the Arena? Showcase your unique strategy to the world every season! ● For Guild and Glory! 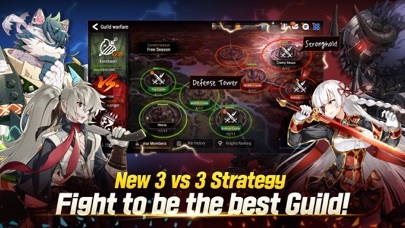 Full of intense 3v3 battles, Guild Wars are here! 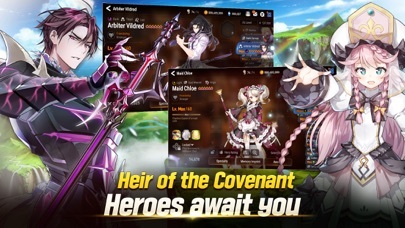 Work with your Guild members to become the strongest Guild! Flexible multilingual support: change display and voiceover language any time! Display: English, Traditional Chinese, Korean Voiceovers: English, Korean *Application Permissions No additional permissions are required. This game is amazing, don’t get me wrong. Giving a low review as the only avenue I can find to say that their decision to change tos to disallow content creators from doing viewer summons or account mentoring is actively the worst community change ive seen in a gacha game. if you’re going to update and kick ppl out of their account, learn to tell the users to register their account or inform users to check their account. seriously just lost my Luna. Can’t remember the account is used for the game and lost my Luna. wow.. Dev needs stop kicking ppl out of their account. seriously annoying. The game won’t make you disappointed if you like anime iOS games. it’s not pay to win and it will definitely keep you hooked for hours each day. trust me. look at the other reviews. Ok, so let’s start from the begging! I got this game by total accident when I was looking for ad offers (to boost up my currency) for a different game. When I started playing this, I wasn’t too interested because I do not watch anime that much and the storyline seemed very complex. However, as I continued, I noticed so much detail and thought and characters that were put into the storyline. For example, there are like 18 different forms of currency (which gets confusing) and other features like the arena, battle, the sanctuary, the summoning library, guilds, and so much more. The storyline is also very cool and there are like hidden adventures you can go on by using secret pathways in the normal adventure. Overall, I think this game is super cool and that may because this is the first rpg I have ever played or that I am only on chapter 4, but it’s great! I truly do not want it to end. I absolutely love this game, from the animations, to the character designs, to the controls, etc. it’s a very well put together game that’s very free to play. I hope the game continues to get great updates! This is a pretty fun game to play, it’s gatcha system on the other hand is not. Now like many other games you’ll more than likely restart the game over and over till you get a strong start, which is kinda something you want to do for this one. Which it has a good system to do it granted you have to rewatch cutscenes that you can’t skip and play though the end of chapter 1 each and every time. However once you get to that part where you get 30 attempts at a single x10 summon to keep you’ll more than likely be stuck here trying to get a character, 4 and 5 star yes but characters in general. So here’s the main problem. Artifacts are far too common as they have a higher drop rate than characters. Really they shouldn’t be in the same pool as characters, it’s a waste of space since they should be entirely separate from characters. Every time you get a 5 star something it’s more than likely an artifact and you need a character to even use the thing. Well even after you’re set with your reroll you’re more than likely to get a 3 star artifact than a character whenever you pull. While a few 3 star units are from what I understand better than some 5 stars it’s hard to appreciate that when you can’t pull even a 3 star character. Also from what I’ve seen there is no safety net for getting 4-5 star anything. Like said it is a fun game to play, but artifacts get in the way far too often, especially when people like to collect characters on top of playing the game a lot. So it’s just a suggestion but it might be better to fully separate artifacts and characters in the gatcha.